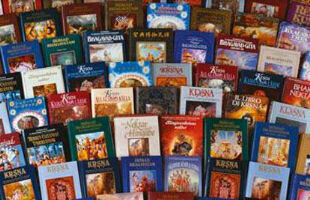 Sastra Dana - The Gift of Knowledge ~ The Toronto Hare Krishna Temple! The world today is undergoing a major crisis; people are experiencing an all-time high level of stress, with insecurity and temporariness of life plaguing all walks of life. Spiritual books like Bhagavad-Gita and Srimad Bhagavatam (the Bhagavat Purana) help alleviate these issues by bringing superior knowledge and happiness into people's lives. In the Bhagavad-Gita, Sri Krishna states, “For one who explains this supreme secret to the devotees, pure devotional service is guaranteed, and at the end he will come back to Me. There is no servant in this world more dear to Me than he, nor will there ever be one more dear.” (BG 18.68 & 69). Thus, we are asking for your help with “Sastra Dana” or sharing of knowledge, by sponsoring Bhagavad-Gitas or other Vedic texts. For example, sponsoring 108 hard-bound Bhagavad-Gitas is $1,080, 108 soft-bound Gitas is only $540, and 108 other smaller Vedic books is $216. You can give as much as your heart desires. There is no minimum, and no maximum, the whole world is in dire need of this literature. Please note that your kind donations towards Sastra Dana will be tax deductible. Over the last five years, by the generous support of our donors, the Sastra Dana Team has placed over 55,000 books in close to 500 locations! This year, we continued placing and replenishing copies of the Bhagavad Gita As It Is in hotels and motels all over Ontario as well as, in hospitals, community/welcome centres and cultural centres in the GTA. Last year, the placements in doctors offices was a new avenue, and this year, placements in international airports was the latest innovation. Other avenues are being explored, and 2017 is sure to bring more venues as Sastra Dana becomes more established and reaches a larger audience every year. The Sastra Dana Team is forecasting several thousand book placements as they continue to increase penetration in hotels and other institutions. In fact, we already have over 1500 Bhagavad Gitas in cue for placement in the first quarter of 2017. To learn more about where we've placed these books please click here. Please support the Sastra Dana Program wholeheartedly to bring these books to newer avenues.